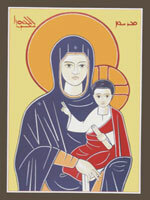 Marth Mariam Samajam Is the Women's Association of the Malankara Orthodox Syrian Church. It is one of the major spiritual organizations of the Church which was founded in 1920 under the leadership of the Rev. M. C. Kuriakose Remban and K. M. Annamma of blessed memory, and many others. The Church has a central committee for this spiritual organization that encourages Church-wide and Diocese-wide conferences, retreats, seminars, and other related programs for the spiritual nourishment of the women of our Church. Aside from a centralized committee of the Church, the Northeast American Diocese has an exemplary group of dedicated women under the able leadership of the Metropolitans and Vice President. The Northeast American Diocese has been organized into seven regions comprising of 7-10 parishes in each region and appointed regional coordinators to conduct Bible Study, seminars, conferences and retreat. Besides regional activities the central committee joined hands with regional coordinators and parish level units to help local charities in each region, helping the poor and needy locally. One of the regions besides focusing on the local charity efforts stretched their helping hands to Attappady, Kerala, India helping the poor in that region. The Marth Mariam Samajam of the Northeast American Diocese, have been vigorous in annual fundraising efforts for charity. Such projects include marriage aid for poor young girls in India, financial assistance to those families afflicted with a terminal illness and ensuring proper medical coverage poor and ailing families. To promote teaching and learning of faith and tradition, Samajam took up the leadership to educate members through 'Divyabhodanam' and leadership training in two centers, Muttontown, New York and Linden, New Jersey. Graduates are leading many spiritual activities in the local parishes. God Renewing Orthodox Women/ GROW, the young women's organization is active among second generation women of the church. It began in 2012. The Diocesan committee regularly visits all parish Marth Mariam Samajam fellowships, as well as organize two yearly conferences, The Parents & Couples Conference and The Womens' Conference. This spiritual organization continue to rally and live its motto of 'pray, act and shine' in their parishes, in their homes and in their daily lives. The Church offers prayer and other activities for this ministry on August 15th, the Feast of the Dormition of the St. Mary, the Mother of God, the patron of this spiritual organization.